Carmen Sandiego. Ugh. Even the name turns my stomach, churning up 20 years of animosity and frustration. Ever since that fateful day in 1989, when her henchman flunky, Rob M. Blind, slipped through our fingers with the Rio Grande, I have devoted myself to the destruction of Sandiego and her V.I.L.E. criminal empire. Our irreconcilable differences have knit us together like a sweater made of irony. Her experiences and adventures become mine as I chase her around the globe – our lives lived in lockstep with Carmen always one step ahead. Most recently, this cat-and-mouse game took me to Iceland – a small island country known for its geothermal energy, fish exports and Viking heritage. Sandiego was there to coordinate the effort of V.I.L.E. 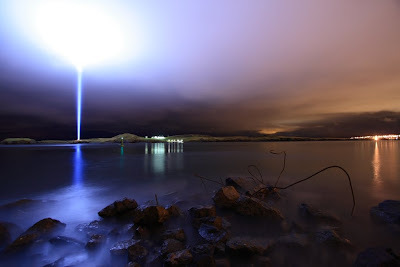 operatives to steal Yoko Ono’s Imagine Peace Tower, a shaft of light beaming up from a rock off the coast of Reykjavik. One can only assume that the malignant madam planned to use the tower to light her secret hideout. I started with this whole Carmen Sandiego thing because that was where I first learned the term “spelunking.” And I went caving in Iceland. And I’m not patient enough to write an effective transition. So we went to a cave in Iceland and crawled around. It was nice, but I there were many things that I will have to chalk up to “learning experience.” The next time I go caving, I’ll be so much better. Here are a few lessons for you, my faithful readers, so that you can avoid my mistakes and make a whole bunch of your very own. 1. Do not wear a stocking cap under your helmet. It might be nice for the walk out to the mouth of the cave over uneven aa boulders but once you get inside, the cap will constantly slip down over your eyes and blind you even ore than the intense belly-of-the-whale darkness. 2. Do not wear Danskos. There are two reasons for this – 1) the rough volcanic basalt that you will be clambering over and tripping on will not be kind to the soft leather uppers of your favorite shoes, 2) If you are already pushing 6feet and entering a cave that will scrape the head of even the shortest spelunker, do you really want to be two inches taller? I didn’t think so. 3. If you are a beginner caver, as I was, am and forever will be, it is probably best to take the short cave tour. That way, just when the reality of your situation – that you’ve willingly buried yourself underground (with nothing but a headlamp and a very fragile human guide to keep you oriented) and are wiggling through holes that look just big enough to permit your 6-year old niece – you can catch a glimpse of blue light and know that around the corner the mouth of the cave, blowing snow, and freezing winds are awaiting you with open arms of open space. Oh, and incidentally, Carmen did get the Imagine Peace Tower. But nobody really minded.